For more than 25 years, ACN has strengthened mission-driven organizations by serving as Chicagoland’s premier society of professional nonprofit consultants. As thought leaders in this focused and ever-changing sector, our members provide organizations with a rich resource of expertise, education and experience. Experienced. Our consultants’ practices represent the full range of functions and skills needed by nonprofits of any type, age, or size to thrive. The typical ACN member works with five clients per year on engagements ranging from day-long commitments to year-long projects. Committed. ACN members represent the best of what it means to be committed to helping people. With an average of 10 years in their current consulting practice and 22 years working in the nonprofit sector, our consultants have weathered countless storms alongside their clients – and gotten them safely to shore. Collaborative. ACN provides its members the opportunity to collaborate with clients and colleagues alike, in order to provide exceptional service throughout the nonprofit sector. ACN members consistently report collaborating with another member in the prior year. From hosting relevant, timely programming to facilitating networking through pop-up events and online forums, ACN strives to promote the highest caliber of collegiality across sectors. 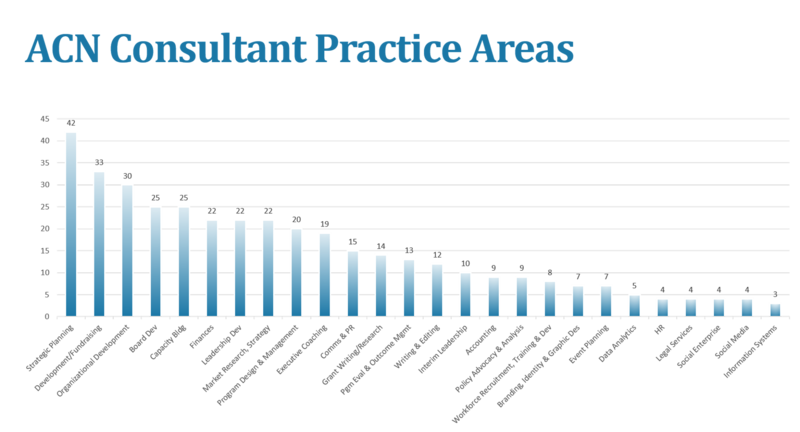 New to Working With Consultants? Download Our Guide!